The only Civil War Era wall map of the United States issued by the U.S. Government. The Washington Map of the United States. 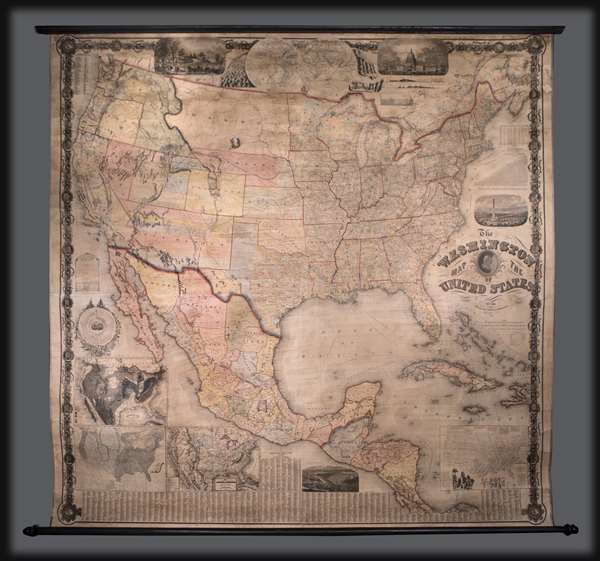 This is the 1861 second edition of Matthew Fontaine Maury’s important wall map of the United States, published by simultaneously by Taintor & Company in Philadelphia and Holmes Harrison & Company of London. This map covers the entirety of the United States as well as adjacent parts of Canada, Mexico, and the West Indies. Maury, the original cartographer who published this map in 1860, was a Confederate and, at the outbreak of the Civil War in 1861, left his government post with the National Observatory to join the southern uprising. Consequently, many of Maury’s original embellishments, including a portrait of cartographer himself, were removed in this 1861 edition to be replaced with vignettes of the U.S. Capitol and Mount Vernon – as depicted. Between Mt. Vernon and the Capitol there is a map of the world on a hemisphere projection, with comparative charts of the world’s great mountains and waterfalls to either side. Left and right margins feature medallion busts of the U.S. Presidents. Inset demographic maps are Hitchcock's Geologic map of the U.S., Loren Blodget's map of the annual rainfall and Traill Green's zoology map. Above the title is now a vignette of the Washington Monument and above, the table of air-line distances between various cities. Along bottom there is still the vignette view of New York, a table of the 1860 U.S. Census, and a large inset demographic map showing agricultural staples and distribution of plants. At left, above the inset maps, are details regarding religious denominations in the United States. Cartographically this map is derived from a combination of U.S. Coast and Land Survey maps as well as earler maps of the United States. As Superintendent of the National Observatory, Maury had access to all of the most up to date cartographic work compiled by the U.S. Government. Maury’s treatment of the Transmississippi region is particularly noteworthy with a post Colorado (1860) and pre Arizona, Wyoming, Idaho, and Montana configuration. The explorations of Beckwith and others associated with the proposed transcontinental railroad, including Northern Pacific and Central routes, are noted. Also noted is the Pony express Route, and various emigrant and Wagon reoutes between the Mississippi River valley and various west coast cities. The Colorado silver mining region is also identified. In all this is an extremely rare map of the United States and the only Civil War era wall map to be issued by the United States government. Matthew Fontaine Maury (January 14, 1806 - February 1, 1873), United States Navy was an American astronomer, historian, oceanographer, meteorologist, cartographer, author, geologist, and educator. He was nicknamed "Pathfinder of the Seas" and "Father of Modern Oceanography and Naval Meteorology" and later, "Scientist of the Seas," due to the publication of his extensive works in his books, especially Physical Geography of the Sea (1855), the first extensive and comprehensive book on oceanography to be published. Maury made many important new contributions to charting winds and ocean currents, including ocean lanes for passing ships at sea. In 1825 at age 19, Maury joined the United States Navy as a midshipman on board the frigate USS Brandywine. Almost immediately he began to study the seas and record methods of navigation. When a leg injury left him unfit for sea duty, Maury devoted his time to the study of navigation, meteorology, winds, and currents. His hard work on and love of plotting the oceans paid off when he became Superintendent of the U.S. Naval Observatory and head of the Depot of Charts and Instruments. There, Maury studied thousands of ships' logs and charts. He published the Wind and Current Chart of the North Atlantic, which showed sailors how to use the ocean's currents and winds to their advantage and drastically reduced the length of ocean voyages. Maury's uniform system of recording oceanographic data was adopted by navies and merchant marines around the world and was used to develop charts for all the major trade routes. Maury's work on ocean currents led him to advocate his theory of the Northwest Passage, as well as the hypothesis that an area in the ocean near the North Pole is occasionally free of ice. The reasoning behind this was sound: Marked harpoons found in captured whales in the Atlantic had been shot by ships in the Pacific and vice versa, and this occurred with a frequency that would have been impossible had the whales traveled around Cape Horn. With the outbreak of the Civil War, Maury, a Virginian, resigned his commission as a U.S. Navy commander and joined the Confederacy. He spent the war in the South, as well as abroad in Great Britain, acquiring ships for the Confederacy. Following the war, Maury accepted a teaching position at the Virginia Military Institute in Lexington, Virginia. He died at his home in Lexington in 1873 after completing an exhausting national lecture tour. Very good. Professionally restored. Presented on original wooden rollers. Schwartz, S. and Ehrenberg, R., The Mapping of America, pp. 287-288. Phillips (America) p. 909. Rumsey 2820.000.